Johnny Williams knows he has a fight on his hands to keep hold of the number 12 jersey at London Irish, despite a whirlwind start to his senior career. 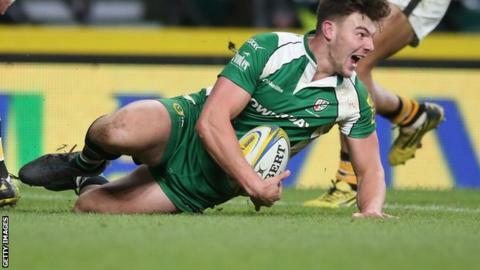 The 19-year-old centre, a graduate of the Exiles' academy, has scored four tries in his first three appearances. Two of those came on his Premiership debut against Wasps in front of a crowd of more than 42,000 at Twickenham. "Scoring at Twickenham, it's something I've dreamed about since I started playing at the age of six," he said. But, the Reading-born inside centre is keeping his feet firmly on the ground as he targets both a continued run in Tom Coventry's side and a first Premiership win of the season for Irish. "We've been unlucky with injuries in the centre and I've been given a shot," he told BBC Sport. "I know those players are coming back and they're fantastic, but I'd love to keep the number 12 shirt and I hope I do. "For me, it's about getting this experience and trying to be the best player that I can." Williams, who has already represented England at under-17 and under-18 level, is now hoping to break through into the under-20 squad. His brace against Wasps caught the national for the first time, but he still found fault in his own performance. "I don't think I carried the ball as much as I have in previous games," Williams said. "I made a lot of tackles as we spent a lot of time without the ball. It was a fantastic occasion with lots of friends of family, but it was a shame about the result."